Lindsey led Region shore operations to support more than 350,000 service members and civilian employees. During his time in command he initiated and supported improvement efforts throughout the region’s six states to include renewable energy, intergovernmental support agreements, infrastructure improvements on and off bases, and efforts to enhance the quality of life of civilian employees and service members. During his speech, Lindsey spoke of partnerships, teamwork and accomplishments of the Navy Region Southwest team and thanked everyone for their dedication to mission accomplishment and hard work during his tenure. “During her speech, Vice Admiral Jackson listed many of the accomplishments of the men and women of Navy Region Southwest over the last two and a half years, and I’m extremely proud of them for how well they’ve supported our tenants and our customers, said Lindsey,” he said. Lindsey then conveyed that although he is proud of all the work accomplished under his leadership, the things he will remember and mean the most to him are the moments spent with staff, partners, and all those supporting the mission. He cited several examples and then created one more special moment. As Flores reached the stage, Lindsey informed him that he had been selected for promotion through the Navy’s Meritorious Advancement Program. After his final remarks, Lindsey read his orders and relinquished command to Bolivar. 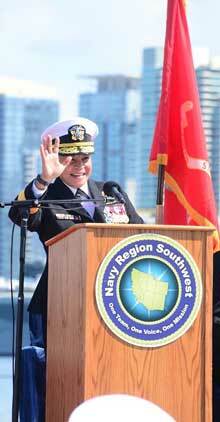 Lindsey will assume command of Navy Region Europe, Africa, and Southwest Asia in Naples, Italy in April. Bolivar reports to San Diego from Jacksonville, Florida, where she served as Commander, Navy Region Southeast. After reading her orders and assuming command, Bolivar stepped to the microphone and addressed the crowd.